Here are the writings and compositions by Richard L. Rose which you may access on this site. Obviously, I would prefer to be cited for any use you make of my works, but givers cannot control what is done with their gifts. 1. FRAMESHIFTS: The work for which the website is named is a novel in 2 volumes, made of interrelated stories and poems about a Northern Virginia community. 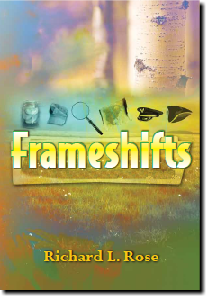 See: 2001916 _FRAMESHIFT1 2011 version or buy a copy from Amazon. See the home page for purchase details.The book Death Wears a Tricorn is the first story in the book published as an e-novella. See the side-bar on the home page. Following up on the novel was Hidden Moves and Hidden Faces, a book of short stories. See: Hidden Moves and Hidden Faces pdf The last book of Frameshifts was also expanded into Finding a Purchase, a book of poems. See: FINDING A PURCHASE. Additional sources about Frameshifts on this site are More Information about Finding a Purchase, About Frameshifts, and the Neely Papers. See item 7 below. The Neely Papers was modified to become On Giants. See: On Giants This includes a ballet based on Oscar Wilde’s story, The Selfish Giant. 3. Work on Yourself is a collection of all my poetry. As of 5/20/2015 it is a work in progress. See Work on Yourself Selected Poems vers 2. It is currently under revision to be published under the title A Precious Splatter. 4. The texts of two children’s books are on the site. Copies of the books themselves, with illustrations by Sushmita Mazumbar (See her website: http://www.handmadestorybooks.com. ), are in the Special Collection of the Main Library in Richmond, VA. The books are Shura, in Kathryn’s Book and The Queen and the Crocodile, also found in Hidden Moves and Hidden Faces. The link is given in the first item, above. 5. Librettos and scores for musical works are also available. These include Annunciations, (See Annunc. Bk 1 and Annunciation 2 (2) ), Amber (See AMBER libretto booklet and Amber 1 (9) and Amber 2 (8) ), The People’s Voice (See The Peoples Voice ), The Books of Daniel (See BOD Libretto 1 and BOD ACT 1.1 and BOD ACT 1.32 and BOD ACT 2.1 and BOD ACT 2.5 and BOD ACT 2.71 P3 and BOD ACT 2.61 ), La Rinuncia (See La Rinuncia ), The Fisher of the James (SeeThe Fisher of the James and Music Book Scan ). Other compositions are in progress. Dates for coming performances are posted on the home page. Recordings of productions of these works are on my GENERAL WEBSITE. An MP4 of the “In Sweet Surrender” program featuring La Rinuncia and Missa brevis is below. It may take time to load. Also, make sure that it is set at the beginning of the recording, the title frames. Also See: http://marginalnotesinwordsandmusic.org. Currently, a new production is underway. Strike the Rock! will feature two one-act operas: Amber and Monte & Pinky. The latter is a new work. 7. Finally, see the pdfs listed below for more information about Frameshifts and for the poems read by Richard Rose at the 2015 Poetry Festival of the Poetry Society of Virginia in Williamsburg, VA on May 15-16, 2015.